We had family from Sheffield staying at The Watch House last week. In contrast to early August the weather was atrocious. From what I can deduce most of the week was spent in a cycle of getting drenched, drying off, eating and playing board games: all essential elements of a British summer holiday. Attempts to claim the inclement weather was abnormal were met with doubtful looks. Broadstairs languishes in a rain shadow, making a week of the wet stuff rarer than hen’s teeth. To Northerners this is just par for the course. The weeds have made merry and several plants, including begonias, Streptocarpus saxorum and Impatiens kilimanjari, have prospered in the cool, wet conditions. Our family left on Saturday morning and the sun promptly re-appeared for two full days before going elsewhere for the Bank Holiday. Today it has rained from dawn to dusk, the heavens scattering crystalline tears over our late summer flowers. 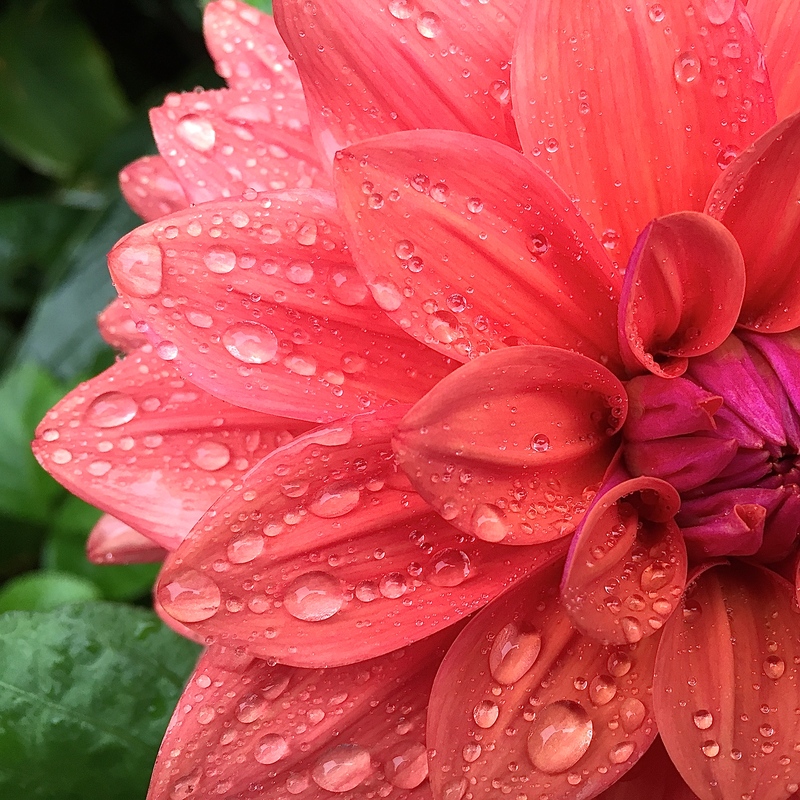 Photographs taken using iPhone 6 in our coastal garden. From top: Dahlia ‘American Dawn’, Lantana ‘Desert Sunset’, Dahlia ‘Firepot’, Fuchsia (unknown variety), Dahlia ‘American Dawn’. Sorry about the weather! Great photos! Well, that’s the weather for you. I’m headed to London and the Cotswolds with a group on Friday. Can’t tell much yet, but the temps look nice. We are in the high 80s to mid-90s in South Carolina this week, so 60s will be a nice change. How lovely. 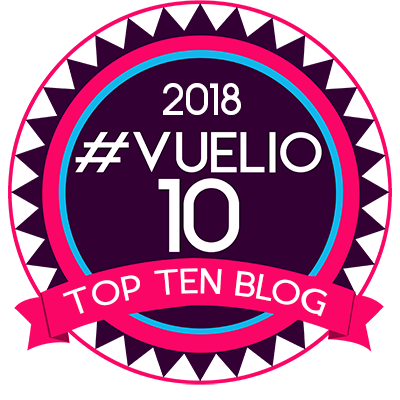 Are you visiting anywhere special? I love Seizencote. Haven’t been for years but love the crazy Indian architecture and the cattle grazing in front. It’s cool here at the moment, feeling distinctly autumnal, but forecast is for a warm, dry month. Have a great trip. Hope to read all about it! Thanks Judy. It’s fun experimenting with the iPhone. I find I use it more and more for the blog, even when I have the SLR with me. It captures colour very accurately, but is no use when zoom or depth of field is called for. Same weather in Worcestershire too rain all day then a lovely sunset! How odd! Brilliant photos that iPhone camera is brilliant…who needs another camera? Thanks for brightening up a typically wet grey Bank Holiday Monday! It was horrid wasn’t it? Such a pity. I am very inspired by the iPhone campaign on the London Underground showing incredible shots taken with the iPhone 6. I know there are probably phones with better cameras but Apple really know how to sell the features of their products, especially to addicts like me. I wrote my dissertation on a Mac that had a monitor with a green screen, so have been more loyal than most! At least you didn’t have to water . . . and as others have mentioned the rain dripping photos are fantastic. Him Indoors looked at me as if I were deranged when I started watering in the middle of a downpour. The fact is that under the canopy of foliage the compost stays pretty dry. It did save me doing the borders though 🙂 glad you enjoyed the photos Jan. Such garden wisdom and commitment! No wonder your plants are so happy. They all have such lovely poetic names. 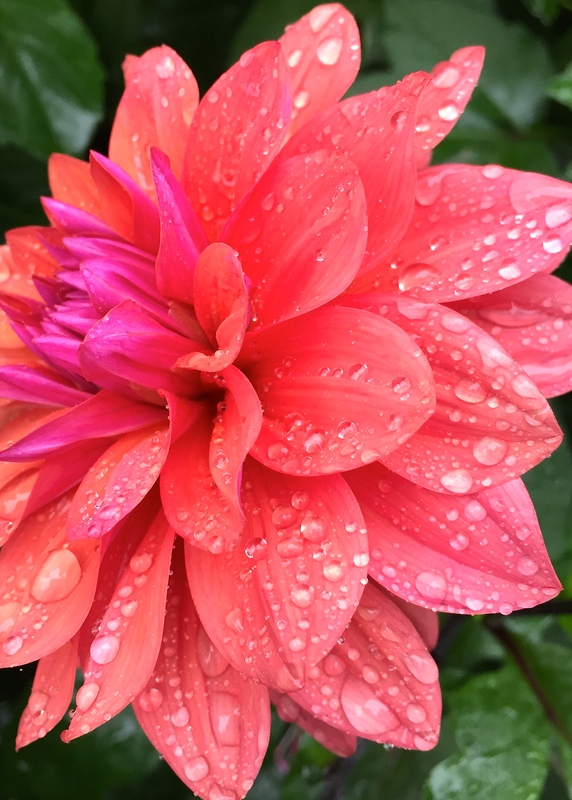 The firepot Dahlia is simply stunning! It’s surreal. In full sunlight the colours of Firepot are even more intense. 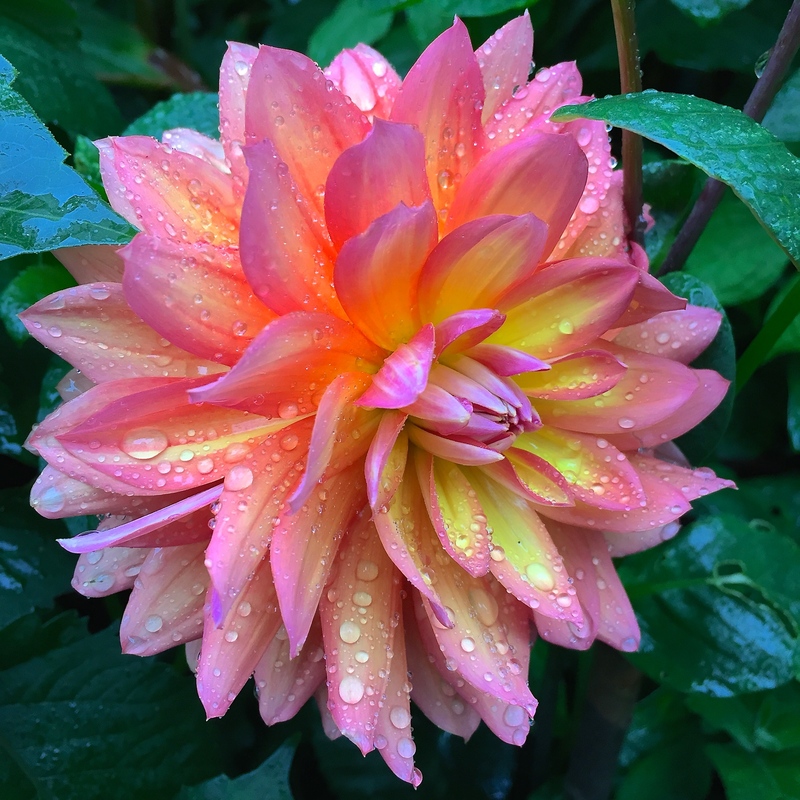 Have a look at this post I wrote a little while ago: https://frustratedgardener.com/2014/08/09/daily-flower-candy-dahlia-firepot/. It positively glows! I think you have more of an artist’s eye than superb equipment – …….. and Hurrah!! 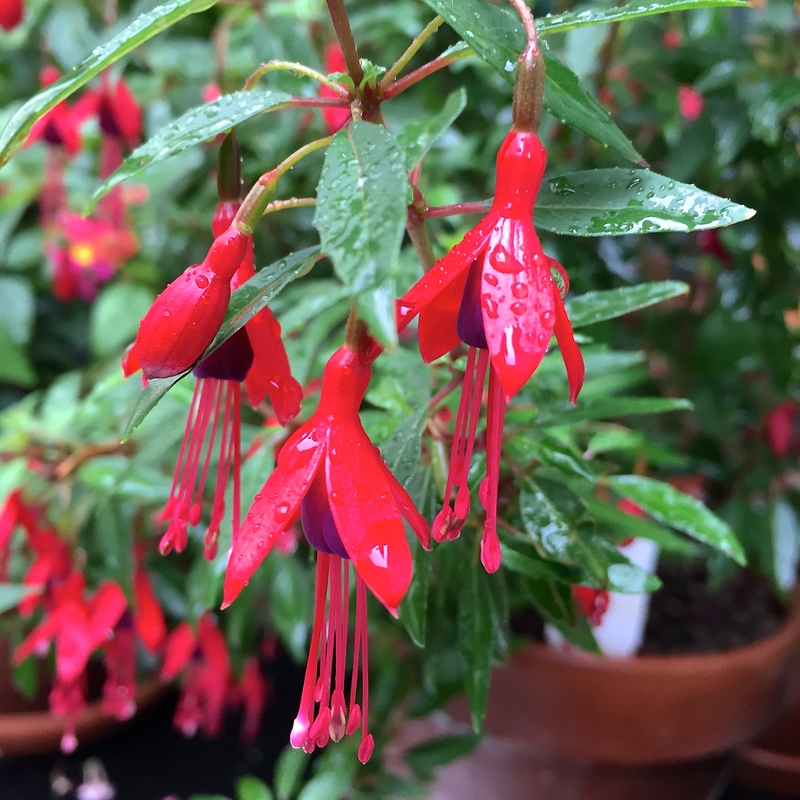 I know something you don’t – the fuchsia is Mrs Popple – I only read of it lately so don’t know the background of the word but they grow like weeds here in Ceredigion. 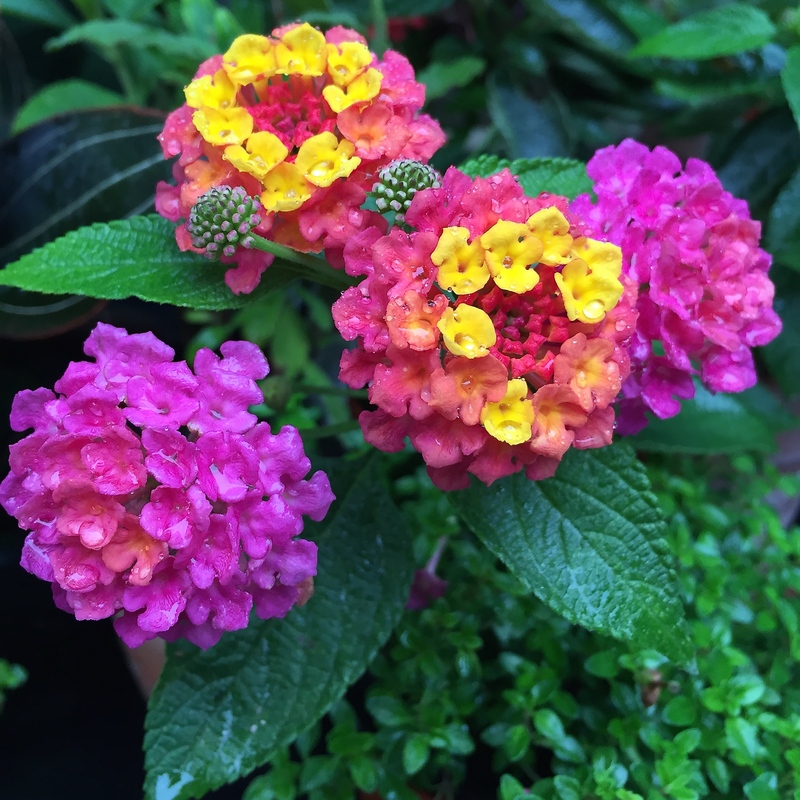 I do love Lantana! And it blends so well, with your dahlia “Firepot”.